Congratulations Mark Radoja, Winner of Event #24: $5,000 No-Limit Hold'em Shootout ($436,568)! Three days ago 387 players began play of Event #24: $5,000 No-Limit Hold'em Shootout, and now there stands only one. Mark Radoja was able to defeat Jeffrey Gross heads up to capture $436,568 in prize money and his very first gold WSOP bracelet. The field began with 40 tables stacked with nine or ten players, each of them had a simple goal: be the last man standing at that table. As simple as that may sound in theory, the structure of this tournament makes for many day-one eliminations and all around tragedy for many players. Some played heads up at their table for hours only to be sent to the rail with no prize money whatsoever. Day one saw many casualties such as Jeffrey Lisandro, Jason Mercier, Barry Greenstein, Oliver Busquet, David Benyamine, and many more. However, the 40 players that were able to best their table and advance through the day were guaranteed a cash prize and at the very least a one in forty shot at a WSOP bracelet. Day two brought a different challenge to the players, formatted with ten tables of four players each. Beginning short handed, the players would have to beat three other competitors at their table once again in order to be promised a spot at the final table. 30 more players were eliminated from the field this day, including Gavin Smith, Tommy Vedes, Erik Seidel, Justin Bonomo, and JP Kelly. That being said, ten men advanced through the field and comprised the final table. Surrounded by the lights and glamor of the ESPN Final Table set, ten men began today with a WSOP bracelet and over $400,000 in prize money in mind. Throughout the day, the chip lead traded places between many different players. Once the field was down to the final five, it seemed no one would be sent to the rail, as the short stacks continuously doubled up. However, as the blinds continued to raise and the pressure went up, one by one players were eliminated, bringing us down to the final two competitors: Mark Radoja and Jeffrey Gross. Each player had an extremely large and enthusiastic cheering section behind them, loudly and passionately rooting them on for every pot they scooped, or consoling them for the pots they lost. Radoja began heads up play with a two to one chip lead and never relinquished his lead. Gross managed to double up once but never crossed the six million chip mark. Eventually, from a preflop all in, Radoja's was able to defeat Gross' , and Radoja and his section exploded in cheers of joy. 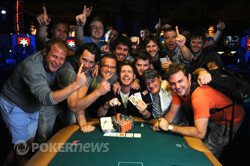 With this win, Radoja has more than doubled his WSOP tournament winnings. Last year, Radoja had his highest finish in a WSOP event, coming in 3rd in the $5,000 Six-Handed Hold'em event, but now he has finally topped that, earning his first bracelet tonight. PokerNews sends their congratulations to Mark Radoja for taking down this tournament, a gold WSOP bracelet, and $436,568 in prize money. Jeffrey Gross Eliminated in 2nd Place ($269,742); Mark Radoja Wins! 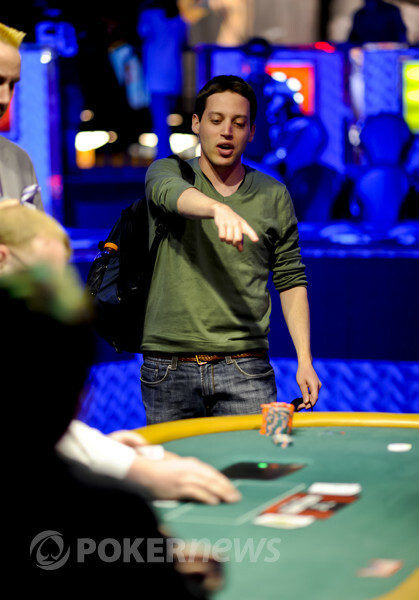 From the button, Jeffrey Gross pushed out a stack of chips amounting to a raise of 500,000. Mark Radoja responded with an all in shove and Gross instantly announced a call, slammed down his cards and began celebrating after seeing what Radoja held. 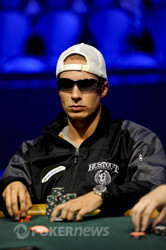 With Gross in the lead with his ace-high, both players' rail stood up and started cheering for an assortment of cards. With Gross' rail consisting of Antonio Esfandiari, Phil Laak, Matthew Waxman and many more, the flop would send them sinking as Radoja had come from behind to take the lead. Needing any ace, king or jack to take back the lead, Gross would see the land on the turn to send Radoja's rail into a screaming fit as Gross was left drawing dead for the win. The meaningless spiked on the river to send Gross to the rail in 2nd place for a $269,742 payday as Radoja's rail rushed the Thunder-Dome and surrounded Radoja in a fit of hugs and craziness before busting out their famous chant taken from the song My Sharona by The Knack. When you gonna give me some time, Mark Radoja? Gun it comin' off the line Mark Radoja! Mark Radoja opened his button with a min-raise to 480,000 only to have Jeffrey Gross move all in. Radoja folded, and Gross captured the pot. Mark Radoja limped the button and Jeffrey Gross checked his option to see a flop fall. Gross checked and Radoja pushed out 250,000 only to have Gross bump it to 900,000. Radoja passed while simultaneously slipping to 9,500,000 as Gross moved to 5,500,000 in chips. From the button, Mark Radoja bumped it up to 480,000 and Jeffrey Gross made the call to see a flop fall. Gross checked as Radoja fired out a continuation-bet of 400,000 only to have Gross respond by check-raising to 1,100,000. Radoja paused momentarily before making the call as the turn landed the and Gross checked. Radoja slid out two stacks of green 25,000-denomination chips amounting to a bet of 1,000,000. Gross folded, and Radoja showed his rail his for just eight-high to take the pot and move over the 10 million-chip mark. Mark Radoja limped the button and Jeffrey Gross checked his option to see a flop fall with both players checking. Gross checked and Radoja fired out a successful bet of 250,000 to force Gross' cards into the muck. Mark Radoja completed from the small blind and Jeffrey Gross checked to see a flop. It came down . Gross checked to Radoja who bet 250,000. Gross popped it up to 750,000 total and Radoja mucked his hand, allowing Gross to scoop the pot. Scott Baumstein asks for his "one time" double up.